View the pattern in German! 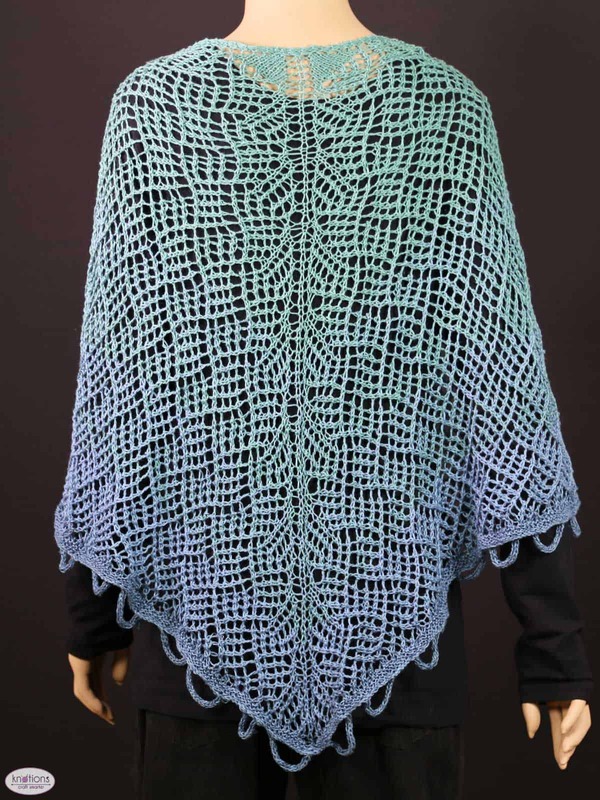 A stunning shawl in a mesh pattern, perfect for a day on the beach – or for days where you want to be on the beach! The double decreases and double yarn overs require some attention to work, but the end result will be worth it! 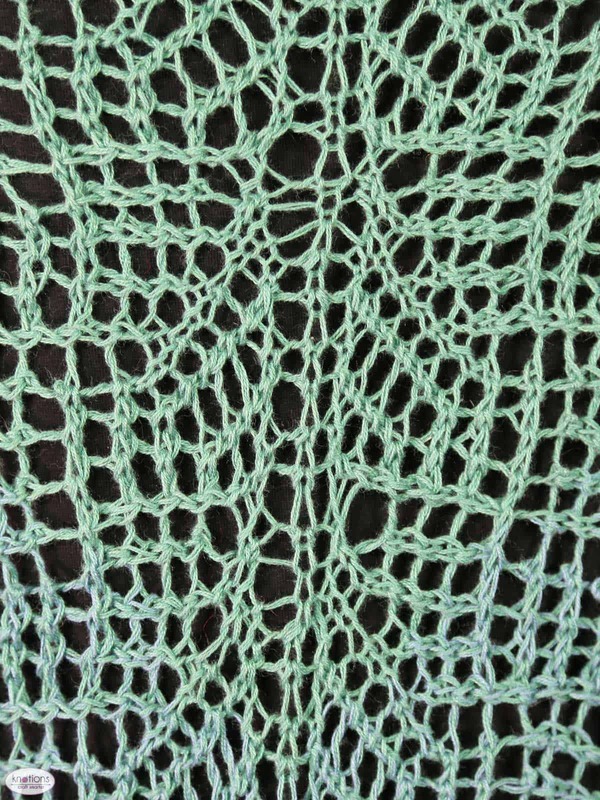 You can choose between a fun border made of i-cord-rings or a more toned down garter stitch border. Optional (for the i-cord border): A long circular of the same size you are knitting with or a little smaller; several small lengths (about 4”) of waste yarn; needle stoppers; two dpns of the same size you are knitting with or a little smaller. 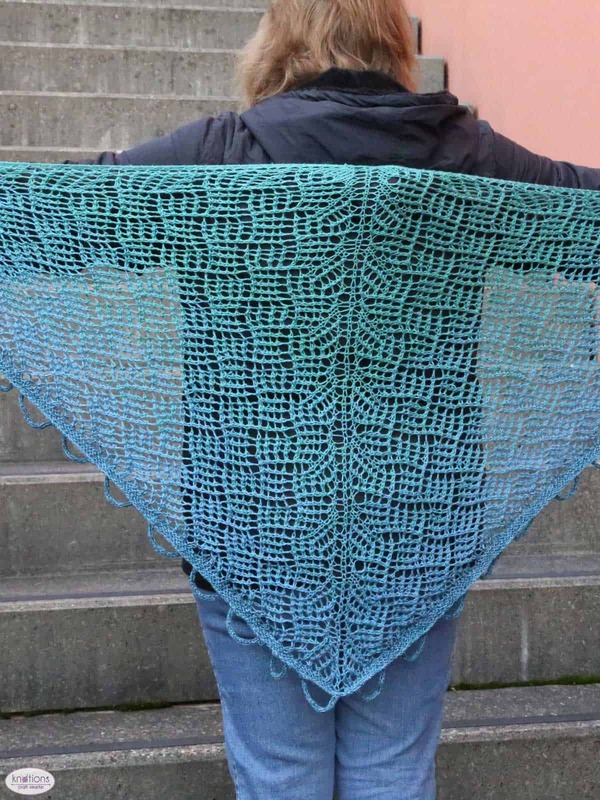 This shawl is worked flat from the top down. The circular needle is used to accommodate the large number of sts. On RS rows, work the right half of the chart to the m, sm, k1, sm, work left half of the chart to the last 3 sts. On WS rows, work the left half of the chart to the m, sm, p1, sm, work right half of the chart to the last 3 sts. 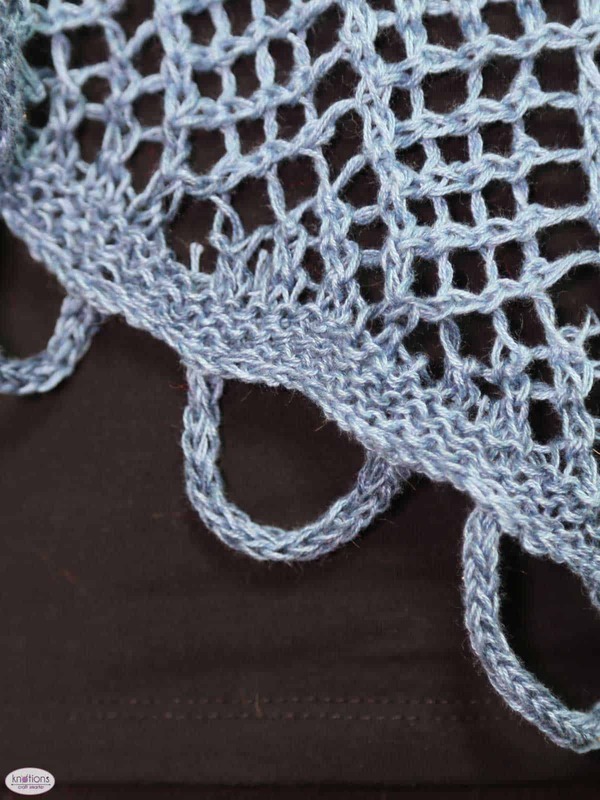 For a bigger or smaller shawl, work as many repeats of the chart as desired. On the first row of the garter st border, increase sts evenly so your stitch count can be divided by 13 + 1 st. For the i-cord border, subtract 1 from your st count, divide the result by 13 and make that many i-cords. 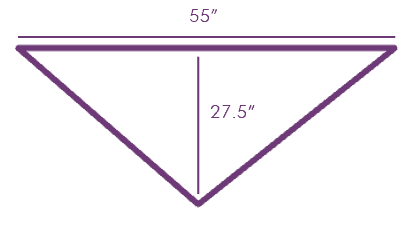 Note that changing the size of the shawl will affect the yardage required. Garter Tab CO: CO 3 sts. Work 7 rows of garter st. 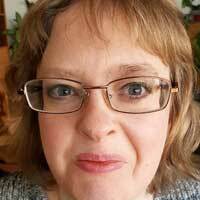 Turn work 90 degrees and pick up and k 3 sts; turn work 90 degrees again and pick up and k 3 sts from the CO; 9 sts. Row 1 (RS): Sl 1 pwise wyb, k2, pm, yo, k1, yo, pm, k1, pm, yo, k1, yo, pm, k3; 13 sts. Row 2 (WS): Sl 1 pwise wyb, k2, p to last 3 sts, k3. Row 3: Sl 1 pwise wyb, k2, sm, yo, k to m, yo, sm, k1, sm, yo, k to m, yo, sm, k3; 4 sts inc, 17 total. Row 4: Sl 1 pwise wyb, k2, p to last 3 sts, k3. Rows 5-12: Repeat Rows 3-4 4 more times: 6 edge sts, 1 center st, 13 sts per side; 33 sts total. Rows 13-140: Sl 1 pwise wyb, k2, sm, work chart to last 3 sts, sm, k3; 6 edge sts, 1 center st, 157 sts per side; 321 sts total. Row 141: Sl 1 pwise wyb, k9, (m1, k7) 43 times, m1, k10; 365 sts. Rows 142-146: Sl 1 pwise wyb, k to end. Remove markers on last row. BO as follows: Sl 1 kwise wyb, *k1, insert left ndl through the front of the 2 sts on the right ndl and k2tog tbl; rep from * until all sts are BO. Break yarn, leaving an 11 yd [10 m] tail. Using a provisional CO and a dpn, CO 3 sts. K3. *slide sts to the other end of the dpn and k3; rep from * until i-cord measures about 3.5” [9 cm]. Undo the provisional CO and put both ends of the i-cord on hold on the long circular ndl. Secure the ends of the circular ndl with needle stoppers. Holding the circular ndl with the i-cords behind your working ndl, BO the first shawl st.
(Work the next shawl st tog with the next i-cord-st; BO the first st) 3 times. K the next shawl st and pass the first st on the right ndl over. 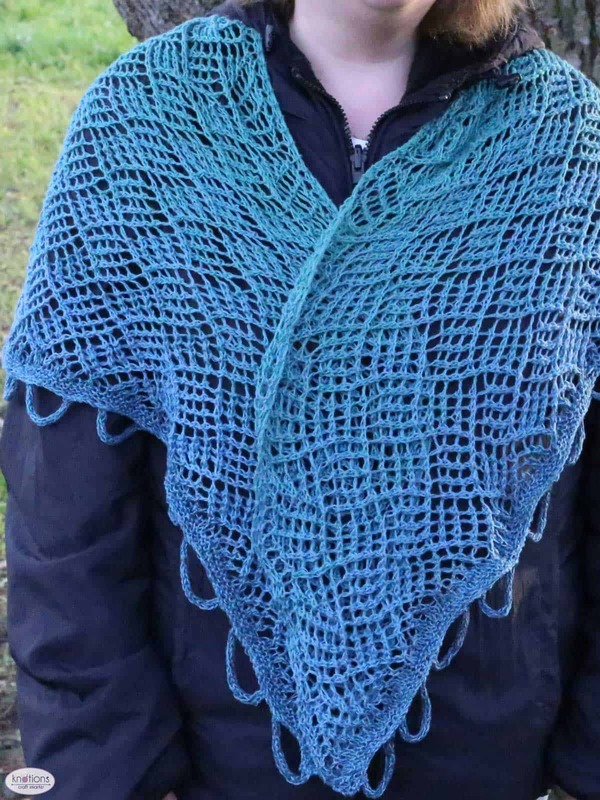 **BO 6 shawl sts. Pass the last st from the right ndl back to the left ndl. 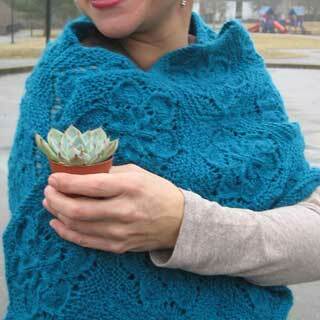 *Work the next shawl st tog with the next i-cord st 2 times. Pass the first st on the right ndl over. 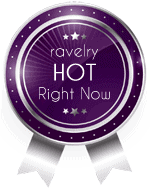 Work the next shawl st tog with the next i-cord st. Pass the first st on the right ndl over. Pass the last st from the right ndl back to the left ndl. Rep from * to * 1 time. Rep from ** until 1 shawl st rem, ending the last rep at ***. Break the yarn and pull through. Block to measurements. Weave in ends.